Step Up to the Xylophone and Crank Out Some Tunes! 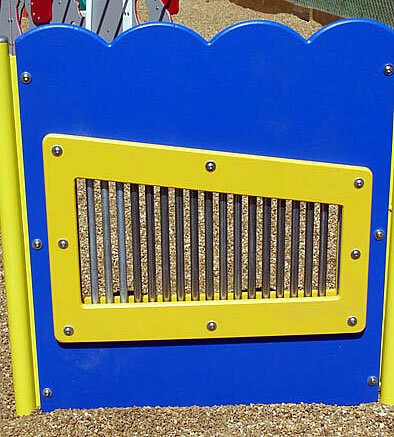 This ADA Music Panel Play Structure brings musical fun to your playground. It’s great for visually impaired kids and ADA-needs kids. There are 17 vertical music bars, each of which produces a different sound. The outside posts are made from galvanized steel, and they measure 3.5″ outside diameter. They are secured in the ground with concrete. The panel alone weighs 70 lbs. Please note that this product does not offer leg room for wheelchairs. Its lower surface mounts to the vertical posts at ground level. The height of the panel is not adjustable (unlike our Steering Wheel Panel, our Gears Panel, and our Dinosaur Panel). Price: Please phone for more information. If you have any questions about the Music Panel Structure, just phone us TOLL FREE.